To truly understand Sacred Geometry we have to understand that everything in the universe is made up of energy and it is in a continual state of transformation. All actions obey distinct patterns, and Sacred Geometry describes these laws through patterns, shapes, forms, music, proportions, and ratios. 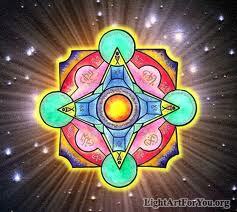 A blueprint of creation, it is an interface between the seen and unseen, the manifest and unmanifest. It unravels the mysteries of life and explains how we are all from the same source, unity and onessness. It is a study of the underlying principles that make our Universe be able to EXIST! It is a universal language of truth, harmony, beauty, proportion, rhythm and order. This entry was posted on Sunday, January 2nd, 2011 at 2:01 pm and is filed under Art of Thinking. You can follow any responses to this entry through the RSS 2.0 feed. You can leave a response, or trackback from your own site.